In my last few posts, you may have heard me complain about the heat and unfortunately not much has changed. This has been one of the fiercest summers I've seen since coming to Australia. I am definitely not a an extreme summer person. I love the milder temperature of spring and autumn, I enjoy the rains and I love winter. When its this hot, all cooking and baking activity in my kitchen drastically falls. We mostly have salads, some sandwiches and any cooked dishes are usually quick and easy ones. I've been eager to increase my repertoire of such dishes and after some searching online, I came across this amazing Satay Chicken Noodle Stir Fry recipe. There are a few stages in the recipe, but they're all really easy and come together very quickly. The beauty of this recipe is that you can serve this either cold as a salad or like I did, slightly warm as a Stir Fry. I can't tell you how immensely flavorsome and delicious it turned out. 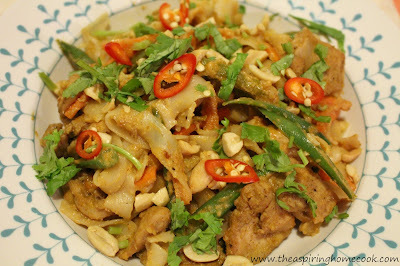 You get the nuttiness from the peanuts, the flavor from the curried chicken pieces, the tang from the fresh lime juice, the creaminess from the coconut milk and the freshness from the fresh coriander. In all, it is a beautifully balanced dish. I am so very glad I tried out this recipe and it sure is a keeper. In a bowl, place the sliced chicken and all the satay chicken ingredients except the oil. Toss well and set aside for about 10-15 minutes to marinade. While the chicken is marinading, make the dressing. Place all the dressing ingredients into a blender or food processor and blitz till you are left with a smooth dressing. While the noodles are cooking, heat another pan over medium heat. Heat 1 tbsp peanut oil and gently tip in the marinaded chicken pieces and the marinade. Toss around a little and saute till the chicken pieces have cooked through. Take out the pieces of chicken onto a plate and set aside. In the same pan, add about 1 tsp more peanut oil. Add the french beans and carrot and stir fry for about a minute. Now add the cabbage and the spring onion. Stir well and stir fry for about another minute. The veggies should have softened a bit by now. I like to leave my veggies on the crunchy side. If you like your veggies softer, cook for a little longer till they are done to your likeness. Tip in the dressing and the chicken pieces. Stir through. Add the cooked noodles and gently toss through making sure that all the noodles are coated in that yummy dressing. Portion out into serving bowls or on plates. Sprinkle some roughly chopped peanuts, chopped coriander and sliced chilly (if using) over each bowl / plate. Lastly squeeze some freshly squeezed sour lime juice over and serve or serve with a wedge of lime on the side.